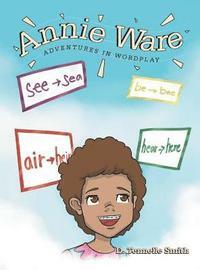 Original recipes and photos with a hearty measure of facts, family, inspiration and humor. Everything food. Some reviews of area restaurants, some whimsical prose for reading pleasure. This recipe was a real joy to create and features roasted pumpkin. I felt the need to develop more pumpkin recipes, and could not recall hearing of or seeing any using roasted pumpkin in rolls. Pumpkin provides a ton of positive attributes like vitamins A and C. They pack a mean punch of calcium, iron, magnesium, fiber and a rich amount of beta-carotene, which also gives pumpkin it's bright color, abundant in anthocyanins. Anthocyanins are flavanoids, antioxidant in nature, that have shown evidence contributing to the prevention of certain diseases and cancers. 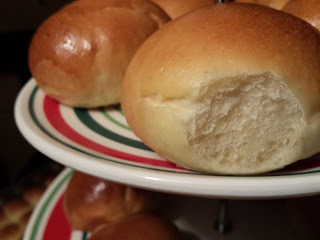 Good dinner rolls are part of what makes any meal memorable, especially around the holidays. Thanksgiving is closing in and here is a perfect recipe to help make your menu POP! I received very positive feedback from my tasters and my daughter Bronwyn loved hers as breakfast and an after school snack, warmed with apricot preserves! Another taster friend of mine enjoyed his with homemade peach jelly. The rolls are light and airy with very subtle roasted pumpkin notes, boasting just the right amount of savory sweetness. This recipe can accommodate a crowd, but don't worry, they may be frozen after baking or before the second proofing stage and will keep for months. You probably won't have that issue though! 2 pkg. yeast, about 1/2 oz. Press the roasted pumpkin through a strainer with a rubber spatula, and into a medium bowl. In a medium saucepan, combine pumpkin, milk and butter. Stir and heat slowly until warm, between 105 and 125 degrees. Make sure you DO NOT heat liquid too much, as it will kill the yeast and affect rising properties. Meanwhile, combine 4 1/2 c. flour, sugar, salt and yeast. Pour dry ingredients into stand mixer bowl with bread attachment. Stir on 1 setting for about 1 minute. Move setting to 2 and gradually add liquid ingredients. The liquid should be lukewarm. Add flour, 1/2 cup at a time until dough forms a sticky ball, about 3 1/2 cups. The dough ball should pull away from the sides of the bowl. Once dough clings in ball on the dough attachment, remove dough and place on lightly floured surface. Knead until dough is smooth and elastic, adding remaining flour if needed, about 5 minutes. It is o.k. for dough to be a little sticky. Place dough in a large greased bowl and turn to coat. Cover with a clean cloth or towel and let rise in a warm and draft free place for 1 hour. After one hour, punch dough down and divide into 3 pieces. Let dough rest for 15 more minutes covered. After 15 minutes, cut each piece into 16 pieces. Flatten each piece with fingertips, then form a ball by tucking the egdes under. Place on greased cookie sheets about 1/2 inch apart for soft sides or two inches apart for more crisp surface area per roll. Let rise (covered) for about 30 minutes more, or until doubled in size. Combine remaining egg and milk in small bowl and brush rolls with mixture. Bake at 400*F for 10 minutes or until golden. Light, airy and full of fresh baked flavor, with a serious side of Love!!! Banh Mi Chow Chow, Antioxidant Extraordinaire!!! This recipe idea came about when I had a bunch of radishes remaining after a meal one night. I wanted to utilize the phytochemical and sulforaphane* rich gems in a manner with ease of access and diversity. 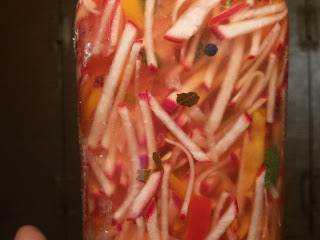 I decided to create a pickled type condiment using most of the same ingredients as you would in a Banh Mi. I enjoy that particular combination and I totally enjoy foods and condiments that are sweet but sour, spicy and tangy at the same time. This chow chow starts with toasting a bit of pickling spice in a dry non stick pan and proceeding with the other pickling ingredients; salt, sugar, water and vinegar. A pinch of hot pepper flakes bring on the heat. Lots of small cloves of smashed garlic add depth and character to this version, and the cilantro and sweet peppers bring brightness and more flavor. This recipe is crazy versatile and addictive. It is not a sweet relish per se, but more on the lines of Saurkraut, with its acidic notes. During trials, I enjoyed this on a regular hot dog with chili, a cheddarwurst dog, and even on a corned beef sandwich, which was spectacular!!! My tasters included three of my sisters and mom, they rated it from liked to loved! 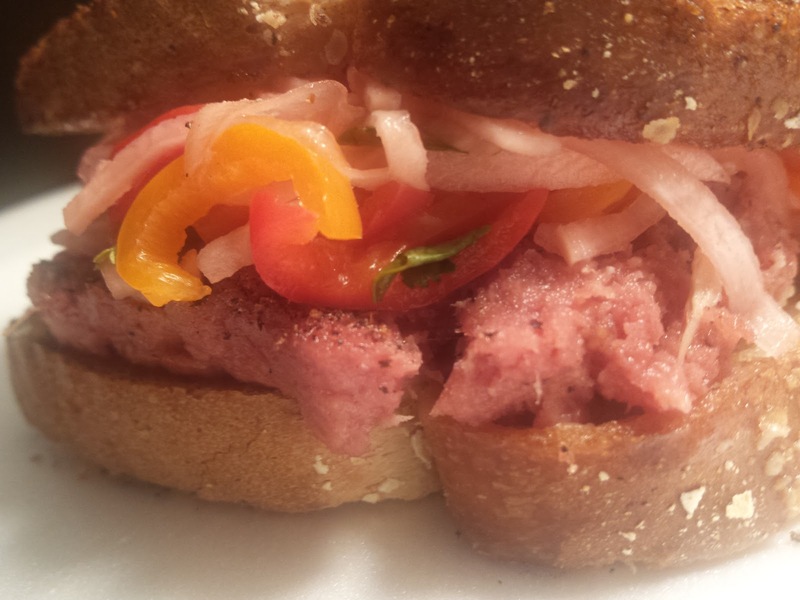 This recipe would pair excellently on a smoked brisket sandwich. I am pleased with the outcome of this recipe because I consumed more radishes in 2 days, than I had in my life thus far...Score one for team eat more veggies! In a medium nonstick skillet over medium heat, lightly toast the pickling spice. Add 1/2 c. water, SEASONED rice vinegar, garlic, sugar, salt, pepper flakes and celery seeds. Turn heat to medium high. Stirring constantly, bring up to a boil for about 2 minutes. Remove from heat and let cool for several minutes. Add remaining water and distilled vinegar at this point to aid in cooling. Stir. 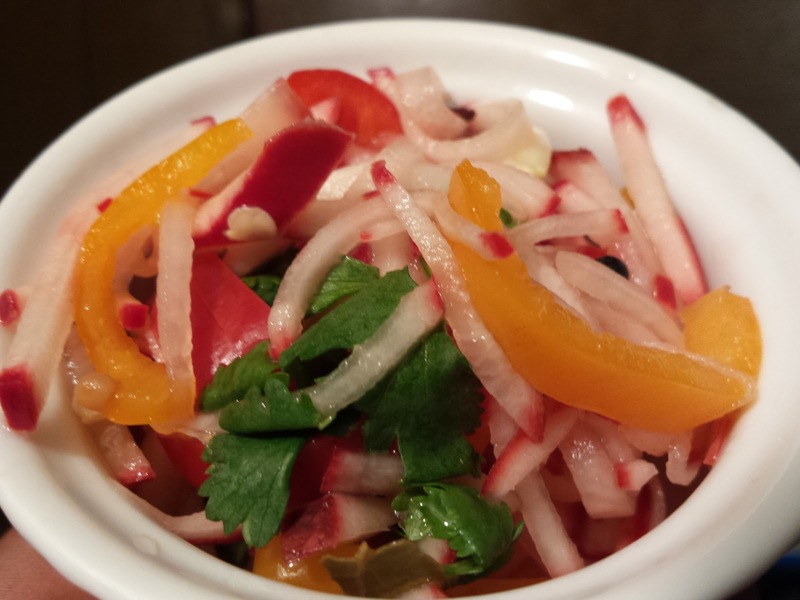 Toss radishes, peppers and cilantro together. Add veggies to an air tight jar or container with lid. Once liquid is completely cooled, pour over veggies. Turn vessel several times to distribute spices. Let stand for about 10 minutes or let sit overnight in refrigerator for more developed flavors. Use a fork to remove from container so it may drain and make sure you remove the larger pieces of pickling spice before each serving. *Sulforaphane is an antioxidant compound which is suggested to help stave off certain cancers like prostate, breast, ovarian and colon. Okay, so this beach trip was quickly approaching and I felt the need to lose a few extra pounds. I had only about a week until departure, so I enlisted the aid of the surefire Military Diet to expedite my goal. One of the meals includes one small apple, a 1 oz. piece of Cheddar cheese and 5 crackers. At face value, the trio was a bit boring, so being the resourceful person that I am, I tweaked the ensemble just a bit. Since the diet is calorie based, I could add the dollop, which is a Chile Garlic Sauce, no fat, no calories. I ended up with a rather tasty treat, interesting enough for your next super snack in less than 5 minutes. I used a mandolin to slice the cored apple. This process really added a sense of volume to the snack. I stacked the slices into even piles. Coring provided the well for the cheese (which I grated and filled in the centers) and I microwaved them for about 35 seconds. I garnished each with a tiny bit of the Chile Garlic Sauce and SPST for a sweet and savory, crunchy and chewy, slightly stretchy and spicy, satisfying snack/meal. Slice off top and bottom of apple. 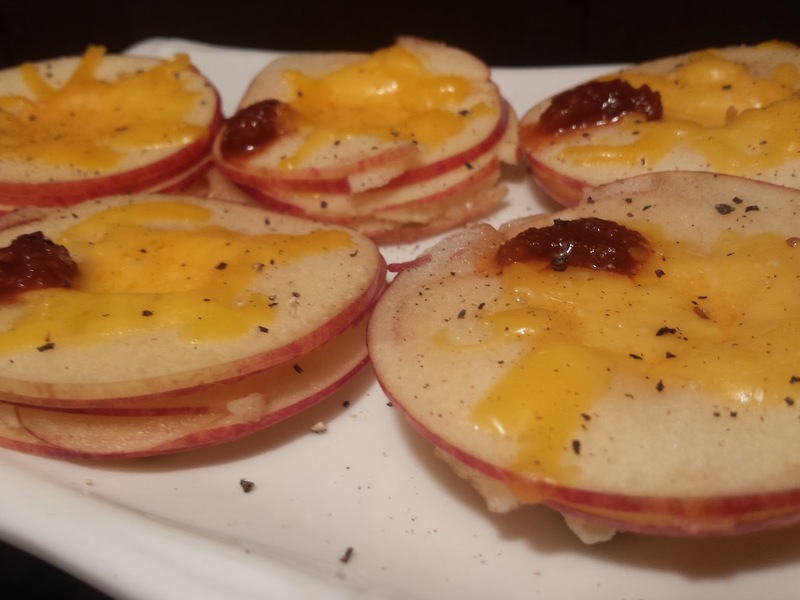 Using a mandolin, slice the apple and make equal piles of them on a microwave safe dish. Grate the Cheddar and fill the wells created by stacking. Offset the base apple slice to aid in stabilizing the cheese well. Microwave until the cheese just starts to melt, about 35 seconds. Top crackers with Apple Stack. Garnish with fresh cracked pepper and Chile Garlic Sauce if desired. 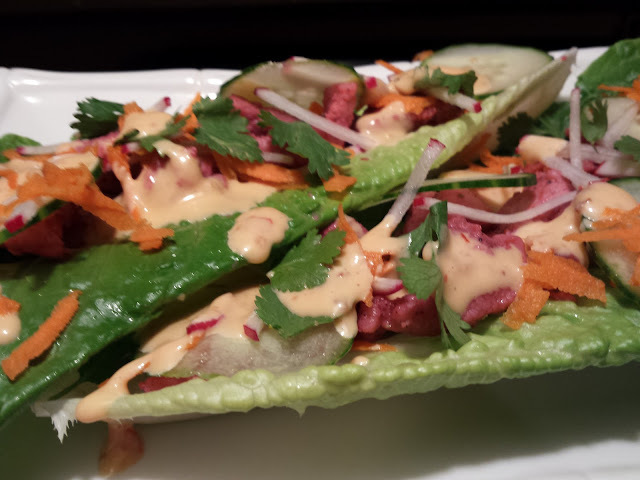 Bursting with color and fresh flavor, this recipe is a gluten free version of the Vietnamese sandwich called a Banh Mi. Traditionally served on a crusty and rich baguette, this style cuts calories and fat tremendously. 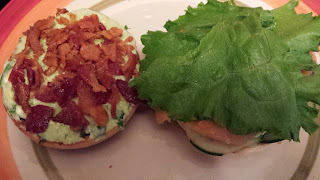 I enjoy the super crunch the Romaine lettuce provides, mimicking a crisp crusted bread. There is no harm in eating 3 or 4, and not having to worry about the fallout. The protein for this dish is marinated overnight, so this dish comes together quite literally in minutes if the prep work for the veggies is done ahead of time as well. A mandolin makes crazy light work of the English cucumber and the radishes( I stacked the radishes after using the mandolin and cut them into matchsticks) Pork is used for this recipe, as is in the traditional, but I marinate this in a Chinese BBQ marinade to give it that brilliant color and flavor profile. I have written an adaptation to this marinade below to achieve very similar and desirable results. Combine ingredients in small bowl. Pour marinade over protein, press out air in resealable bag, refrigerate 4 to 24 hours for fullest flavor and color. Saute over medium-high heat until desired done-ness, at least 145*F.
Combine ingredients in small bowl. Serve along side Romaine Boats. This recipe is great for a week night meal, full of nutrients and relatively easy to make. Considering on-hand ingredients, it is easy on the wallet as well. The filling boasts a healthy dose of spinach and three cheeses, including Cottage, Mozzarella and Parmesan. A small amount of cooked crumbled bacon adds depth to the flavor profile as well as subtle smokiness. The sauce can be home made or store bought, depending on your time constraints and it can be prepped ahead of time and baked when ready. The family received this recipe well, including my nephew and his little girl, Saniah, she is 9 months old! My 8 year old Bronwyn loved them too. Prepare pasta in salted water, according to instructions, cooking until just short of al dente, about 6 minutes. Rinse and stop cooking process under cold running water. Meanwhile, brown beef with onion over medium high heat until no longer pink, about 5 minutes. Drain beef mixture and set aside to cool slightly. While mixture is cooling, combine spaghetti sauces and sugar to taste in medium pot and bring up to temperature. In a medium bowl, fold together beef, spinach, bacon, cottage cheese, 1/2 Mozzarella and 1/2 of Parmesan and egg. While sauce is heating, use a teaspoon to fill shells with beef mixture. Divide heated sauce among two spacious baking dishes, and nestle shells evenly among the two. 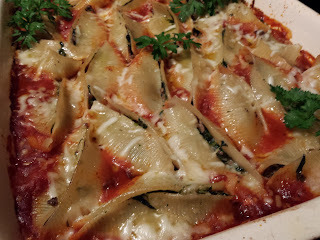 Cover tightly with foil and bake for about 25 minutes or until shells are heated through and internal temperature reaches 180*F.
Remove foil and sprinkle with remaining cheeses and return to oven until cheese melts, about 5 minutes. Let stand for several minutes before serving. Two things inspired me for this recipe, a surplus of buttermilk and a cacophonous amount of corn flakes. I initially processed the flakes into crumbs, as an add- in to breading and for various other fried or oven fried recipes. Alas, fried foods are not a mainstay in our home, so they were more or less just hanging around. In lieu of shelf life, I became curious as to how to utilize the crumbs in a way I hadn't before. I love making homemade biscuits for my family, usually on a Sunday morning, at least twice a month. I fiddled with the ratio of flour to crumbs and was satisfied with a 3 to 1, flour to corn flake crumbs. The biscuits came out beautiful and with a unique flavor profile, accommodating sweet and savory fillings. The corn flake crumbs lend a whole grain appearance to the bread. The texture is supple and interesting. The addition of the corn flake crumbs also add a plethora of vitamins and minerals like Vitamins A, D and C. These puppies also pack a mean punch of B vitamins, Iron, magnesium and potassium. 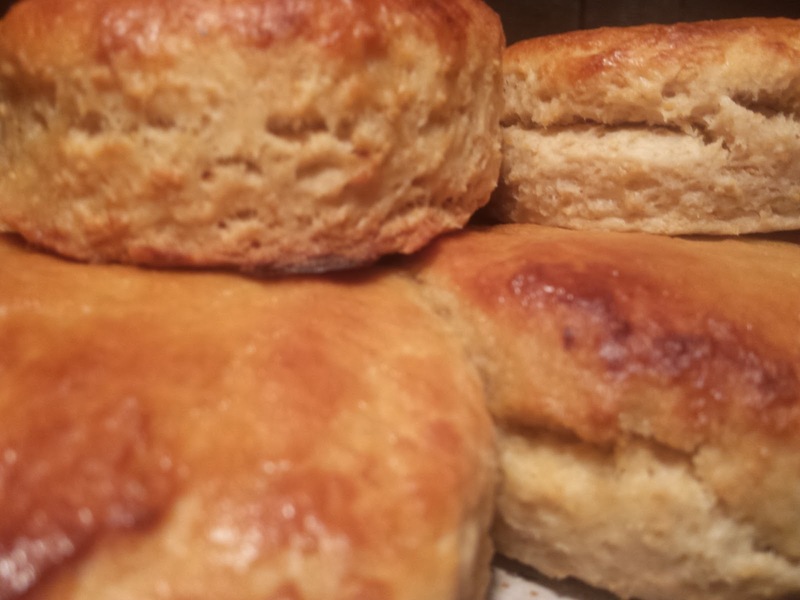 The family received them well and I have been making them in place of my usual buttermilk biscuits. So next time the box of corn flakes gets low and you crave something new and good for you, give them a try. These may become you next favorite thing, perfect for slathering the jams and jellies you made from this summer's fruit and veggie harvests! In a large bowl, sift flour and baking powder together. Add salt and corn flake crumbs. Stir until well blended. Cut in lard or vegetable oil with fork until flour seems grainy and takes on a pebbly appearance. Grate in butter, bit by bit, tossing in flour blend, making sure gratings get singularly coated with flour. Add buttermilk gradually, until stirring creates a loose sticky ball. Pour out onto lightly floured surface. Press dough out with hands, and fold in half. Repeat about 6 times. With lightly floured hands or rolling pin, press or roll dough out to about 1/2 inch thickness. *For thinner biscuits thus more biscuits, simply roll out to about 1/4 thickness. Using a biscuit cutter, cut out biscuits and transfer to large un-greased baking sheet, about 1/2 inch apart. *For a softer sided biscuit, place only about 1/8 inch apart from each other, so they will bake against one another and can be pulled apart when finished. Brush tops of biscuits with buttermilk. Bake until risen and golden, about 15 minutes, depending on oven. Remove from oven and brush with butter if desired. Transfer to paper towel lined vessel and cover loosely until ready to serve. Makes around 1 dozen biscuits. 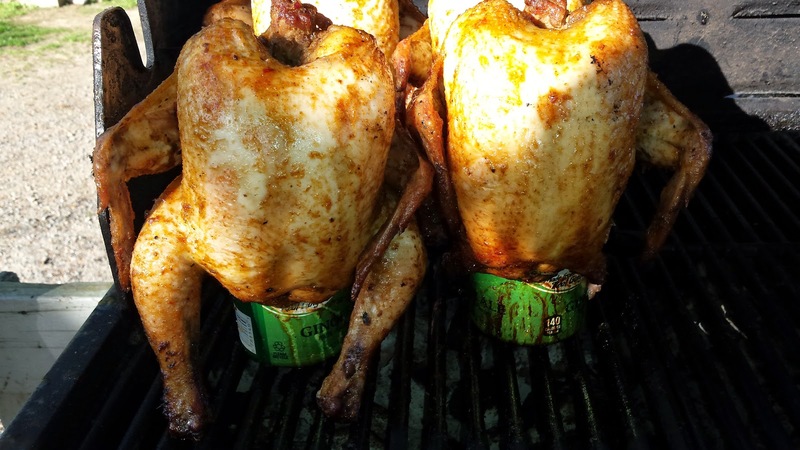 Beer can chicken is all the rage these days. There's nothing quite like the smoky and delicious flavor of a well seasoned protein kissed with a charcoal flame alongside your favorite summertime sides. This recipe is inspired by a hot summer's day, beer and chicken. I used an all purpose Asian spice blend and ginger ale to accompany the smoky wonderfulness that is grilled meats. I brine these birds in a seasoned rice vinegar tinged brine to facilitate some extra flavor and moisture elements. Try this version or maybe experiment with some other carbonated beverages to see what other awesomeness you can come up with. Bring vinegar,salt, sugar and pepper flakes up to a boil. Remove from heat and add ice water. Allow to cool completely and pour over chickens. Turn to coat well. Place in large air tight container or one that can be covered tightly with plastic wrap. Marinate for 6 to 8 hours or overnight,turning several times during marination process. Drain and rinse chickens, pat dry. Rub with olive oil and about 1/4 c.spice blend each. When charcoal is ready, pour about 1/3 of ginger ale from each can and carefully add slits towards the top of can. Space equally around. Slide chicken down over opening of can and grill until thermometer inserted in thickest part registers 165*F., about 1 to 1 1/2 hours, depending on temperature of coals. Let REST before cutting to serve. 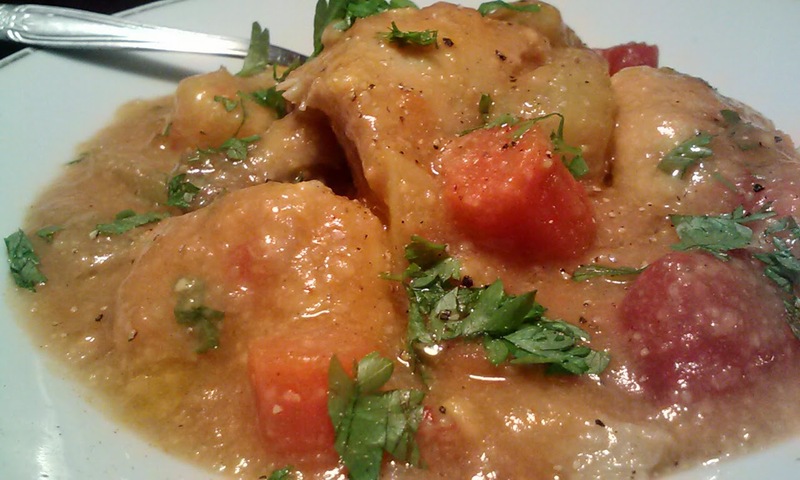 Chicken and Dumplings are a classic and wonderful comfort food, filling and hearty, especially during a chilly night. 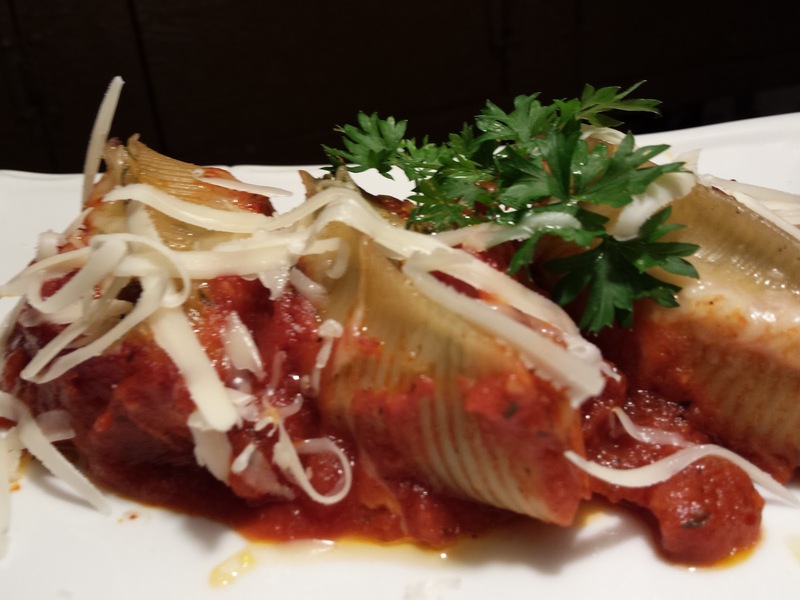 I enjoy making this dish for my family every now and then, but this time I wanted to add a different sort of flair to the old fashioned, deviating from my normal recipe, to create an equally palate pleasing one-dish and fantastic meal. I made the dumplings using a mixture of corn muffin mix and flour, and added Latin American commodities like cumin, chili powder and diced tomatoes to bring the dish together. This dish was very well received by the family and I have since created yet another Latin inspired version, with a smoother, more cream soup like texture. Stay tuned for the recipe in the near future. I used bone-in skinless thighs for this version, but feel free to use the protein or chicken parts of your choice. Drizzle medium pot with olive oil over medium heat. Add onions, halved celery and bay leaf. Cook for several minutes until onions are translucent and fragrant and add chicken and garlic. Turn heat to medium high and add stock enough to cover chicken. Bring up to a boil and skim top of boiling liquid. Reduce back to medium, cooking chicken until no longer pink and done throughout, about 15 minutes. When done, remove chicken from liquid, drizzle with olive oil, cover and set aside. Strain liquid and return to pot. 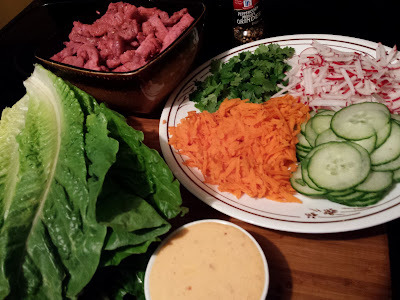 Add sliced celery and carrots. In a small bowl, combine corn muffin mix, spices, sugar and flour. Stir until incorporated and batter can be dropped by tablespoonfuls into gently cooking liquid. Cover and cook until dumplings are cooked through, about 8 minutes. The dumplings will cook apart slightly and this will serve as the thickening agent and add texture. Carefully add chicken and tomatoes back to dumplings and reduce to low. Stir in parsley and butter. Posh Pork and Beans, Gluten Free!! 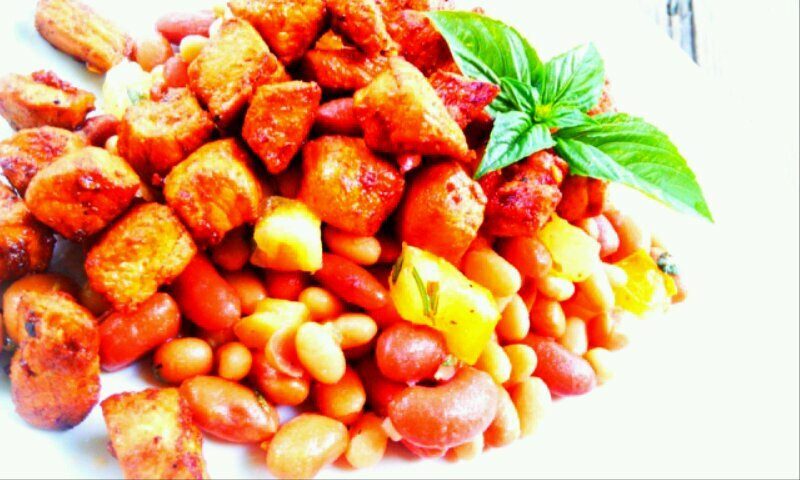 Pork and beans, two staples in many cultures diets. Singularly, they display a wide variety of diversity and flavor, and together... well, you get that stuff found in those tiny cans and eat on camping trips and fish banks, lol. At least that is what pops into my head. Those little cans of sodium and tomato saucy laden sustenance personify a day in time when, money was tight, time to eat was short, and bellies needed fuel for the oftentimes grueling work days that started too early and ended way too late. Nevertheless, that past is still realistically for some, the present. This protein packed meal in a can has been a mainstay since the early 1900's. This recipe is an homage to the trusty pork and bean era. 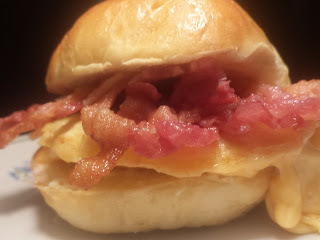 I created a modern day riff of those guys, bringing in a tad more pork to the beans, as opposed to the scant morsel of pork fat that represented the pork portion of it's name. I wanted to showcase this often overlooked combination in a way packed with fresh herbs and flavor, including some fresh tomato, no sauce. There are three types of beans in this version, as well as fresh rosemary and thyme. The bean mixture is marinated in a simple vinaigrette of olive oil, seasoned rice vinegar and fresh lime juice. The pork is marinated also in an Asian inspired and fiery paste, then sauteed until done and may be served as two separate dishes, or mounded together for a new taste of the old school. This dish definitely could coral in some of those pork and bean naysayers. Oh, by the by, vegetarians and vegans may enjoy the 3 bean salad alone, or simply substitute the pork for tofu. Seitan may also be switched in, but with society moving more towards a cleaner, less allergy inducing and more farm to table way of living, eating chunks of wheat gluten really doesn't seem that appetizing to me. Place beans, tomato and herbs in a medium bowl. Whisk oil, vinegar and lime juice together until blended and pour over bean mixture. Fold until well incorporated and coated. Cover with plastic wrap and let marinate at room temperature for 15 minutes. Combine wet ingredients in bottom of medium bowl. Add pork and fold into marinade. Saute over medium high heat until no longer pink and internal temperature reaches 145*F.
I came up with this combination of familiar and figure friendly ingredients after a workout one day. I was in need of something time sensitive and filling, not to mention, delicious! The elements of this bagel are complimentary in all regards and make for a filling and satisfying treat, boasting a host of things good to and for you. Granted, I threw in a slice of crumbled bacon for dexterity and a much welcomed compliment to the crunch and chewiness of the toasted onion bagel, but that may easily be omitted or substituted with turkey bacon or vegan substitute. The spread consists simply of 4 oz. 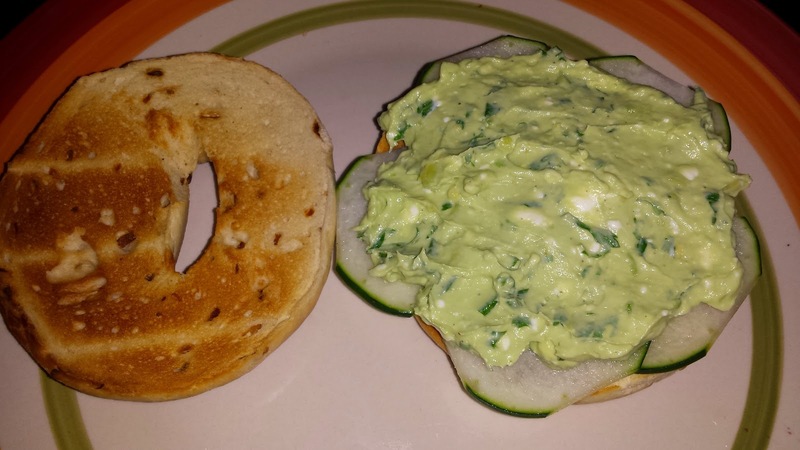 lower fat cream cheese and half of an avocado, one 1/2 fresh squeezed lime, and 1/4 c. freshly chopped parsley. SPST. This spread will be enough for 4 bagels. The avocado of course provides a healthy dose of good fats, poly and mono unsaturated, B vitamins, dietary fiber, a splash of calcium, Iron, magnesium and more. The cream cheese provides much needed calcium and vitamin D.
Parsley is a natural diuretic and lends even more calcium, plus it is super-rich in B vitamins, Vitamins A and C, as well as rare volatile oils , particularly myristicin which is said to reduce formation of certain tumors, and reduce the effects of certain carcinogenic substances on the body's cells, and flavonoids. Flavonoids in parsley are antioxidant in nature, battling free radicals internally. 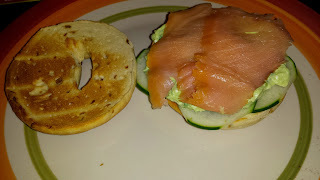 Citrusy lime, water rich and crunchy cucumber, green leaf lettuce, as well as some Omega 3 rich smoked Salmon send this all in one sandwich into a league of its own. One 3 oz. serving of smoked Salmon is enough for all 4 bagels. 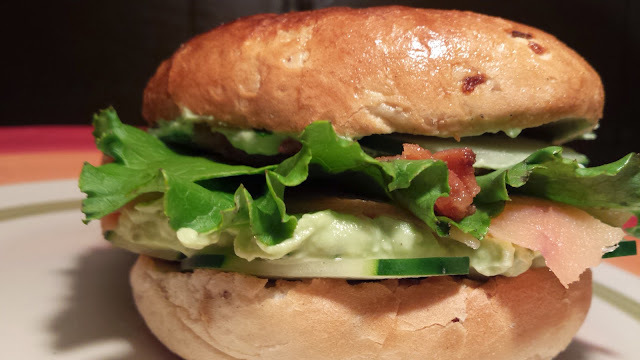 Add as many slices of cucumber and green leaf lettuce as you like. What the hell, on your busiest day, have two of these bad boys, your body will thank you for it. This is a simple yet elegant dish featuring three cheeses and potatoes, pairing well with about ANY protein you can think of. The potatoes are thinly sliced using a mandolin and blended with freshly sliced onion, garlic and parsley from my herb garden. This dish is perfect for everything from cozy dinner to Sunday brunch. I even enjoyed squares of this mildly decadent dish at room temperature. It really brought out the flavor profiles of the cheeses. Substitutions for "skinnifying"can be made if desired, like fat free evaporated milk or other milk product. As is though, this recipe is not too hard on the mid-section and won't have to be added to your list of foods to be eaten semi-annually!! 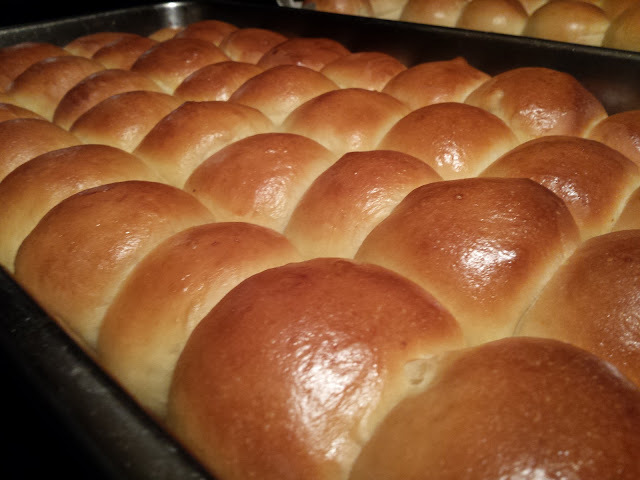 Spread evenly in a baking dish or casserole, about 1 inch thickness. In a medium saucepot, melt butter and tbsp. olive oil over medium heat. Once butter melts and bubbles are small and many, sprinkle in flour. Whisk or stir vigorously, combining and cooking for about 1 minute. Remove from heat and whisk in milk. Return to heat and cook until thickened, about 5 minutes. Reduce heat to medium low. Add garlic. Stir in cheeses until melted. Temper in eggs, by adding about 1 tsp. of cheese sauce at a time to eggs in separate bowl, until it is increased to about 1 cup. Whisk in eggs and remove from heat after about 1 minute. Pour cheese sauce over potatoes and shake the dish to work the sauce down and around the potatoes. Cover tightly with foil and bake until set, about 35 minutes. Check doneness by inserting a knife in center, it should come out clean. Remove foil and cook until golden, about 15 minutes. 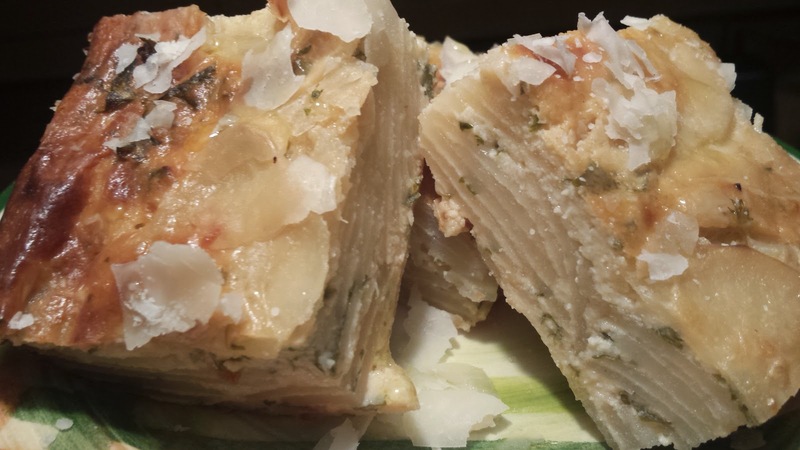 Let stand before cutting into serving squares and garnish with shaved Parmesan. These chilly winter months are a great time to procure homemade sausage from friends and local family farms. I was fortunate enough to do just that, and found the flavor profile very pleasing and past evoking. My family made homemade sausage for many moons as I was growing up. The aromas and absolute deliciousness resonates through my mind to this day. I remember those fateful mornings, beginning around dawn with a blazing fire beneath the scalding tub, positioned perpendicular to the expansive pen in which our livestock gorged and frolicked for months past. The men were responsible for the slaughter, cleaning and breaking down of the animals, with the younger ones allowed to pitch in on the sloughing off the hair and outer skin, after the protein had been submerged in the 'hot tub'. We used this gadget that looked similar to a bell that would sit on your primary school teacher's desk, yet not as deep a bell, nor long a handle. The women were responsible for grinding sausage and packaging . The results were frozen to be enjoyed during the long winter months to come. The hams and side meat was hung in our custom hand-built cement smoke house to begin it's curing process and enjoyed weeks to months later. Nothing was wasted however, the head would be smoked and cured , for the jowl. The feet and ears were utilized as well. My favorite part of the evening was the actual sampling of the finished product. My mother or one of my older sisters would bake a fresh batch of biscuits, brew fresh coffee, then fry wholesome and delicious cakes of the freshest and most delicious sausage, some hot, some mild. A fried egg embellished the top of this unctuous labor of love and teamwork, a memory for which there is no substitute. All the day's toils were well worth it, savoring each and every bite of an event which was indeed a whole year or two in the making. My place in the kitchen had yet to come during those days of old. I was only around 12 and under for those years that we kept our huge working garden and hogs. This recipe is filled with the same type memories, only the labor was not that of our own. The sweet peppers and cheddar cheese, prove complimentary to the savory and sage flecked country gold that is well seasoned and prepared homemade sausage. This recipe produces 2 to 3 healthy serving portions that is completed simply with some fresh fruit. Whole wheat sliced bread makes up the crusty and flavor filled bottom, providing a comfort from all four food groups in one amazing forkful! Brown sausage over medium high heat, crumbling with a potato masher, drain. Remove from heat and stir in peppers, onions, and parsley. In a small bowl, beat eggs, milk, sage and Sriracha together. SPST. Butter 500 ml ramekin bottom and sides. 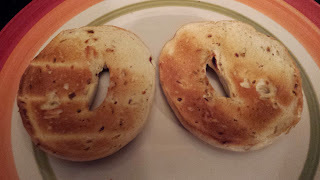 Cut slices of bread in half and press around lower sides and bottom. Sprinkle with half of cheese. Place in oven on baking sheet and bake until center is set, about 25 minutes. The top may brown before middle is set, tent with foil. Korean BBQ Style Frogs' Legs! 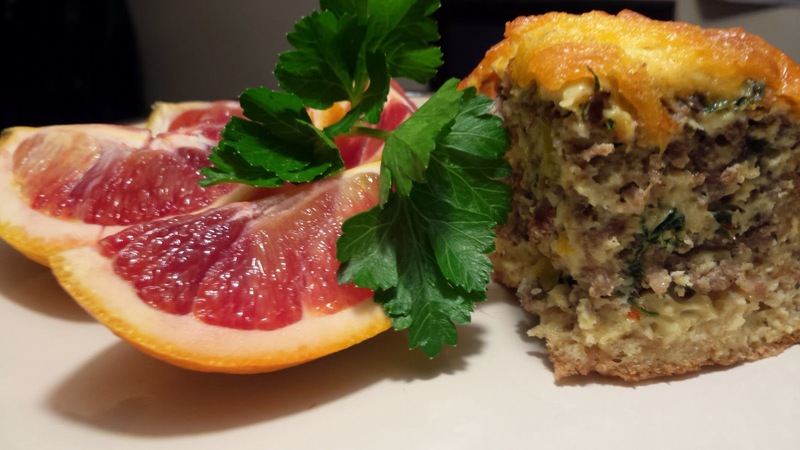 Neillio's Mid-East Southern Corn Pudding! Denese Smith. Powered by Blogger.